Our 22nd Annual STMC Alumni Basketball Tournament takes place at the StanJean Athletic Centre this Thursday, January 31, through Saturday, February 2. 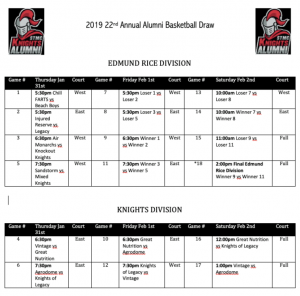 We have 12 teams competing for our Knights (competitive) and Edmund Rice (fun/non-competitive) Alumni Basketball Championships. Games tip off at 5:30pm on Thursday and Friday and from 10:00am until 3:00pm on Saturday. All are welcome, bring your kids on Saturday as we’ll have mini basketball, a bouncy castle and face painting along with food and beverages.